Don’t those all sound awesome?! Go help yourselves to any or all of the recipes! Now for the Easy Pecan Pie Bites recipe. These will just take you a few minutes to whip up. What a great addition to your holiday table! These Pecan Pie Bites are adorable and cute. Cute food matters. Food tastes better when it’s cute. I’ve tried to convince my sons of this truth. I see cute food and think, oh look how cute this food is. They see cute food and they are like, why are these Pecan Pie Bites so tiny? These teenage sons of mine proceed to eat the treats in large quantity which almost, but not quite, negates the cuteness. I suppose I should also let you know that these Pecan Pie Bites are very easy to make. They are made with only five ingredients, which are of course, all real food ingredients. They are naturally gluten and dairy free, which is a lovely bonus if that is a need for you. You can put these together in just a few minutes – my favorite kind of recipe. And above all, they are cute. Cute, cute, cute. They are also magic, so prepare to be amazed. 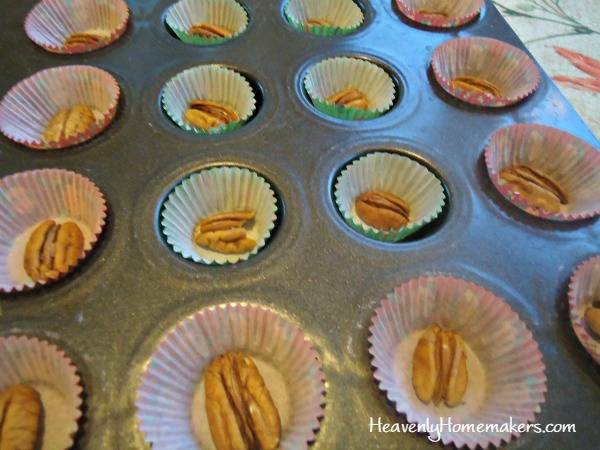 See, you put a pecan at the bottom of each muffin liner. Then you pour in the pie mixture. The pecan rises and bakes at the top, making magical cuteness. Fill 24 mini muffin tins with paper liners. Place a pecan at the bottom of each liner. Whisk together honey, eggs, coconut oil, and vanilla. Scoop mixture into the prepared muffin tin, filling about ¾ full. Bake in a 350° oven for 15-25 minutes or until evenly browned. See? I told you they were easy. 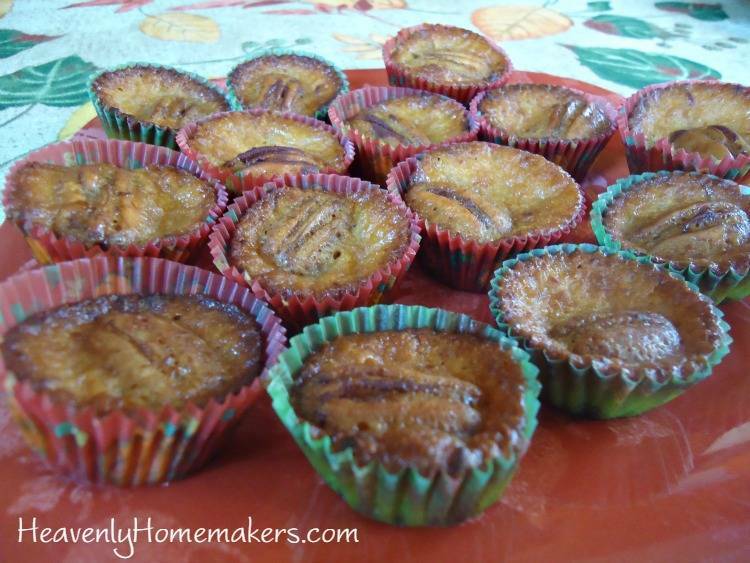 These will be wonderful to have on your holiday table so that when there are pumpkin pies and apple pies and cheesecakes and all the other desserts – people can take one (or five) of these cute little Pecan Pie Bites which have portion control already built in. How very practical of them. 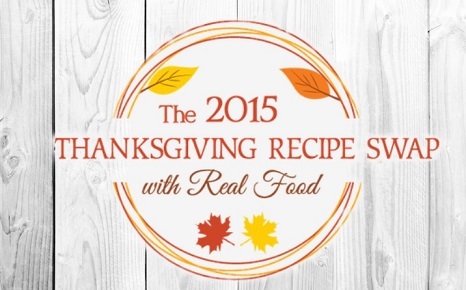 Enjoy, and I’ll see you over at the Thanksgiving Recipe Swap! How far ahead can you make these before you serve them? 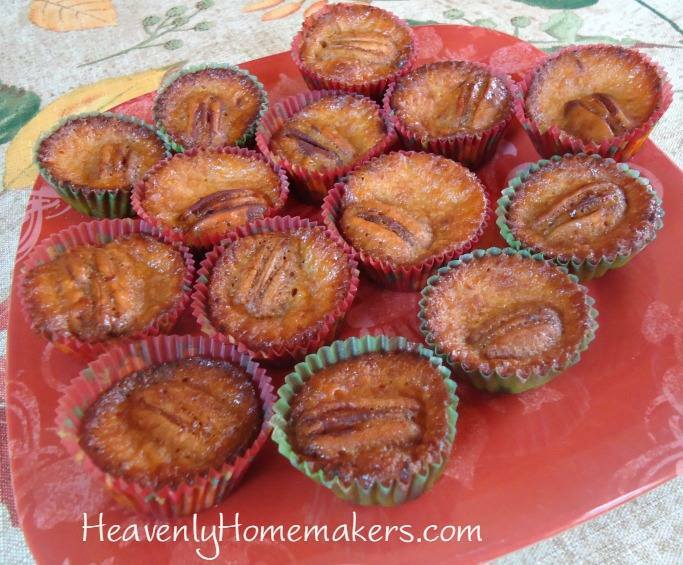 I’ve made mini pecan pie muffins, but never this! It sounds very yummy! And the ingredients are healthy. :) I am definitely trying it this year! I’m making a meal for a new momma today and this dessert is so much easier than what I was going I make. Thank you!!! My 11 and 10 year old girls will enjoy making these. Have you ever made this using regular muffin size? No I haven’t, but I think it would work just fine! I am not a fan of pecan pie, it is too sweet and rich. But………….these just may win me over since I can just have one bite and not waste a whole piece that someone else would have enjoyed! They will also be a great birthday gift for my dad who loves pecan pie! I’ll be adding pecans to my list tomorrow! I have to travel and I’m hoping these will survive the trip if they start out frozen. I agree – I felt it needed just a bit more structure. I made them full-size first, and I definitely think those are not the way to go. Both sizes for me were terribly oily, even when I reduced the coconut oil. VERY tasty, though! I made these for Thanksgiving dinner and they are really good. I think next time I will add just a little bit of salt. They need just a pinch to balance out the sweet.